KWHCoin is pleased to update the community and ecosystem on project developments, breaking news, and latest partnership and roadmap milestones. 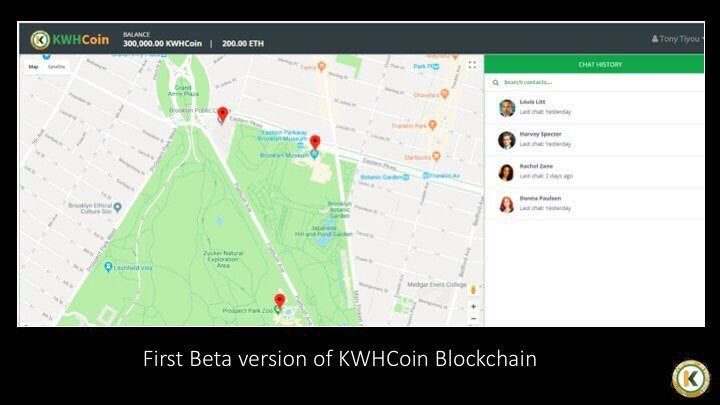 KWHCoin has discovered its niche as a blockchain startup and cryptocurrency within the developing “Internet of Energy” sector. The renewable energy startup is leveraging its blockchain and global network to lower the cost of energy generation while developing its platform (The Grid application and website) for the distribution of affordable energy products globally. KWHCoin and its development team along with ecosystem partners have a successful development trajectory that is consistent with the roadmap and milestone expectations outlined on the link above. On July 11, 2018, KWHCoin announced the digital platform open for the registration of renewable energy generation from its nodes as well as open participation for members of the network. KWHCoin is developing the energy data footprint that will allow energy providers, telecommunications and digital companies, and other entrepreneurs the tools to provide services for this new market. KWHCoin currently has over 60,000 kwh of renewable energy nodes (energy generation data) on its blockchain which now covers every continent with access points in over 40 countries around the world. “We picture ourselves as the “Google” of the “Internet of Energy”. By connecting the renewable energy data of generation assets globally (particularly in Africa, the Caribbean, South America and underserved markets) this will add tremendous value to the development of these areas. Now that we have an energy footprint we will be able to develop and bring more telecommunication and digital services to these areas,” states KWHCoin CEO Girard Newkirk. KWHCoin announces the completion of the Nurse in Hand (NIH) application to serve as emergency post crash response web and mobile solution. KWHCoin is the energy partner and token platform for the mobile solution and web based digital peer based innovation. 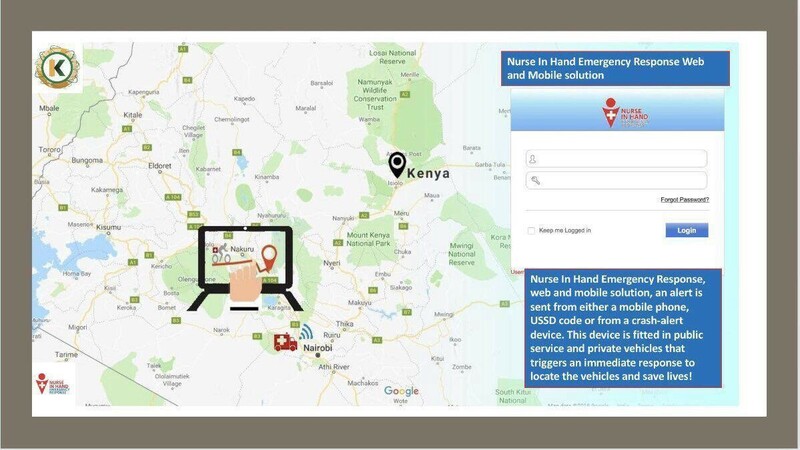 Kenyan startup Nurses in Hand has partnered KWHCoin for an IOT collaboration to develop a totally green emergency response system for the Kenyan Roadway Network and this revolutionary app is complete as pictured above. 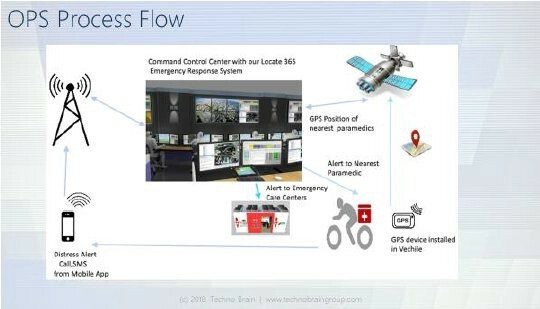 Operational process flow for the Nurse In Hand post crash emergency response system that will enhance the emergency support system for the Kenyan Roadway Networks. Here is a list of the latest KWHCoin partnerships and collaborations. 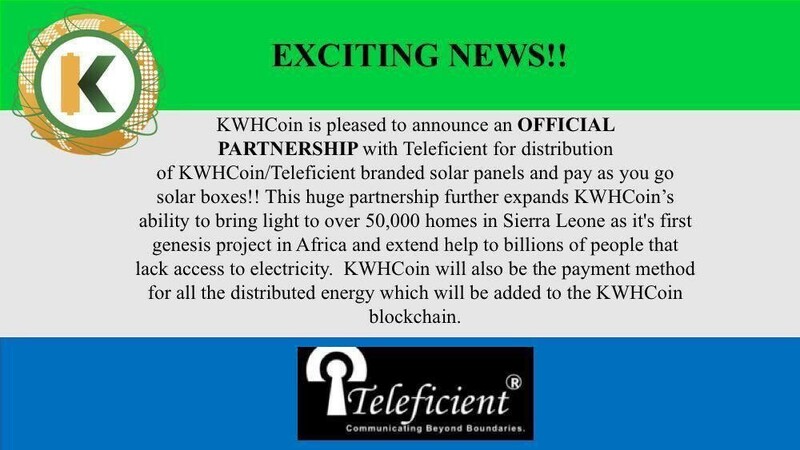 Partnership are critical to the development of a global ecosystem of renewable energy generation and distribution that KWHCoin is leveraging to enable billions access to energy access. KWHCoin and The Chariot Group are partnering to develop and establish policies and procedures that will develop and sustain unique and sustainable village based (localized)economies through appropriate harvesting and use of water and solar power(as well as combined distributed energy resources such as wind, biomass, etc )in rural communities in Kenya. KWHCoin and Solareum will partner to integrate renewable energy product development and distribution. SOLAREUM’S core mission is to ensure that it is today’s “Amazon of Renewables” for individual and corporate consumers alike so the synergies with KWHCoin are a perfect fit to enable access to renewable energy solutions and products. SOLAREUM opens up with new trading pairs! On July 19, 2018, KWHCoin announced a collaboration with Cape Fear Community College (Sustainable Technologies) in a partnership focused on advancing blockchain, decentralization applications, and sustainable technologies. On July 13, 2018 KWHCoin announced the creation of its non profit social impact organization the My Stella Foundation. 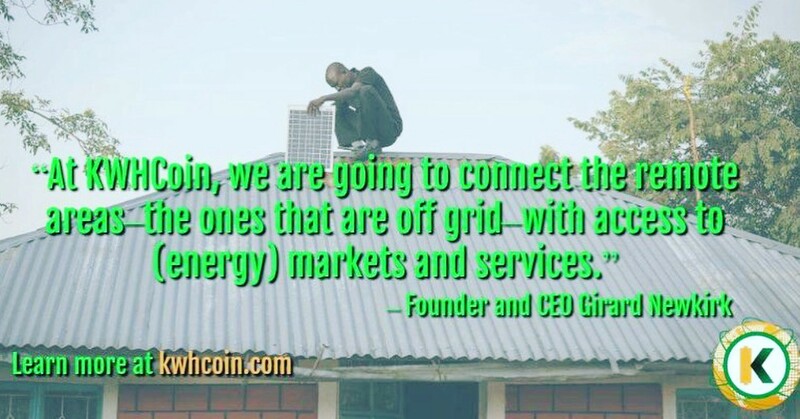 KWHCoin has a mission to connect the 1.2 billion people in the world without energy access to its app and cryptocurrency serving as a liberation technology to billions. It also intends to use cryptocurrency and other technology platforms as a tool for liberation while enabling access for billions to resources and tools to help advance economic development and the social condition for millions of people around the world. KWHCoin has been added to listing on CoinGecko a cryptocurrency ranking chart app that ranks digital currencies by developer activity, community and liqudity. KWHCoin has been added to Live Coin Watch a cryptocurrency news site covering Bitcoin (BTC), Ethereum (ETH), altcoins, ICOs, and blockchain technology. The platform is a real-time cryptocurrency price index with graphs and historical data for 1500+ coins including Bitcoin, Ethereum, and altcoins from major cryptocurrency exchanges. 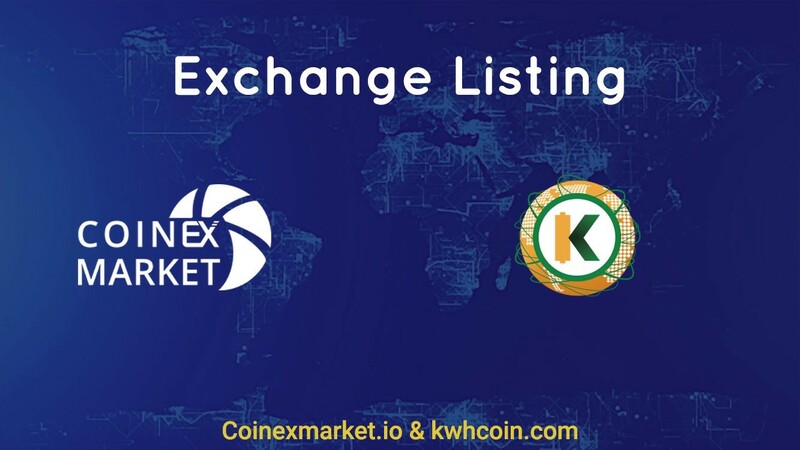 KWHCoin listed on Coinmarketwatch with comprehensive analysis, graphs, tracking and real time data quotes tracking over 1000 cryptocurrencies and blockchain projects. Kenyan startup Nurses in Hand has partnered KWHCoin for an IOT collaboration to develop a totally green emergency response system for the Kenyan Roadway Network and this revolutionary app is complete. KWHCoin will develop and manage the energy generation and distribution for this project and the KWHCoin will be paired in the app as form of payment for services of the emergency response system. KWHCoin is exploring opportunities with manufacturing and distribution partners to revolutionize renewable energy microfinance. Merging the principles of Pay as You Go with cryptocurrency provide the bones and structure for a dynamic new green economy and KWHCoin is a “thought leader” and on the forefront of developing token based models with industry leaders. Launch Date: Distribution and renewable energy asset development in Sierra Leon will commence with the end of the rainy season. 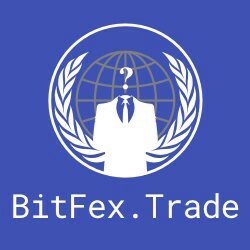 Development partners are targeting end of September/October for deployment and are currently negotiating final arrangements with manufacturing and software partners. 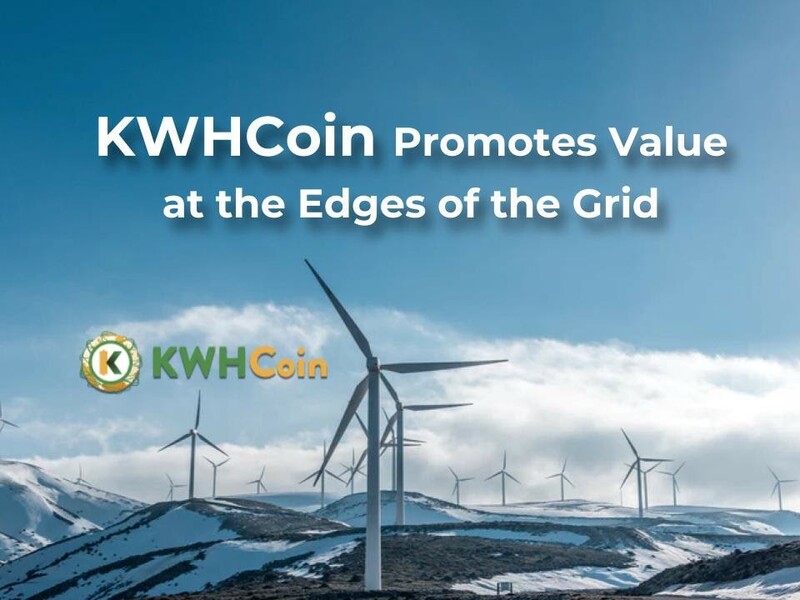 KWHCoin’s focus is on the edges of the grid and the populations that are currently not being served by centralized grid services and that have friction points that prevent energy access. Ecosystem Development KWHCoin has renewable energy nodes (distributed energy resources with energy data usage on the KWHCoin blockchain) on all 6 continents and over 40 countries. KWHCoin now has an energy data footprint that has access points across the globe. There are over 60,000 KWH of energy data integrated into the blockchain and KWHCoin has an energy data footprint that expands across its primary target areas on the continent of Africa, the Caribbean and South America. 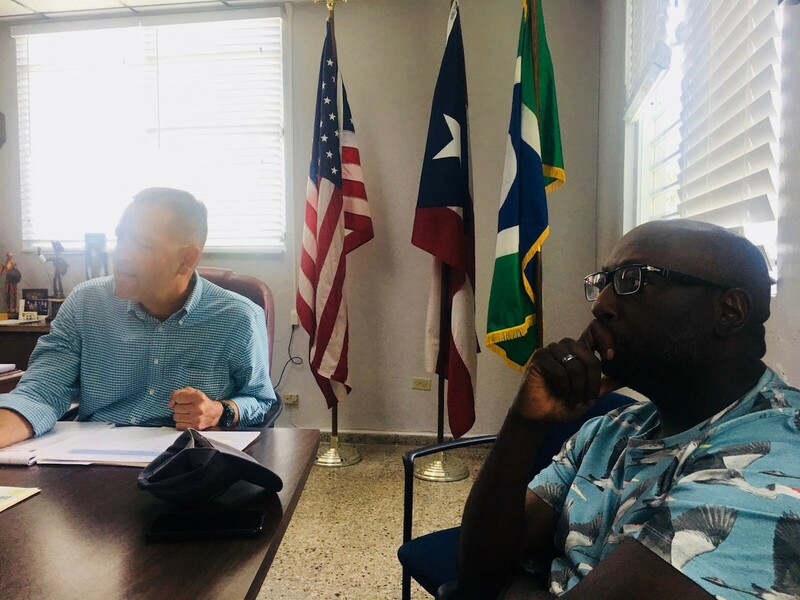 KWHCoin CEO Girard Newkirk meeting with mayor of Orocovis Jesus Edgardo Colon in May 24 to discuss the areas that most need development and KWHCoin solutions for Orocovis and surrounding municipalities. Launch Date: Commencement begins with the end of the 2018 Atlantic Hurricane Season. The KWHCoin team has developed multiple energy generation and development solutions for the island that include a stronger focus on water and biomass assets. September/October is the date ecosystem partners have determined will be safest and most risk adverse for KWHCoin’s genesis development project. 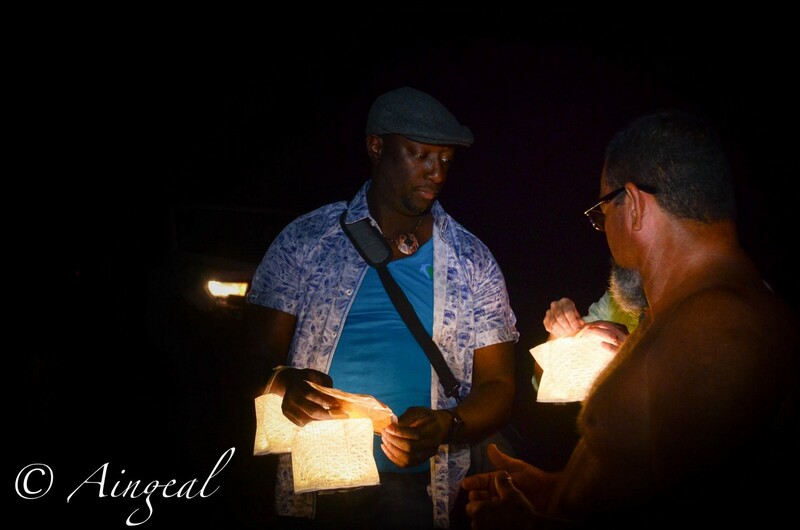 KWHCoin CEO Girard Newkirk in Rio Grande region of Puerto Rico assisting with relief efforts from the devastating impacts of both hurricanes in Puerto Rico.